Now a day, social media plays an important role in everyone's life. Almost all of our friends and family members are on Facebook. Even people from all around the world can connect with you. Some people use it for their business purpose while other use it for their personal life. Also, it's a good place to date someone, explore new things and to search for a new job. Someone said it very well that first impression is the last impression. Same thing applies on social media also. If you've an eye-catching profile and it looks professional, people will find more interest in you and your work. Although, Facebook provide a blue check mark badge for all official profiles and pages but speaking frankly, it's not an easy task to get verified on Facebook. This feature isn't for common people. You've to be a popular celebrity. Well blue check mark badge isn't the only way to prove yourself that you're professional. 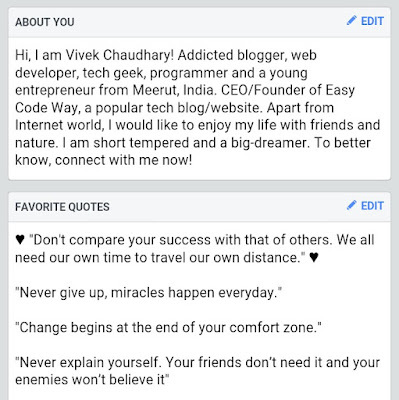 These simple tips will help you to customize your profile in such a way that it will give you a more professional touch. The first thing people look for when they visit your Facebook profile is your cover photo and profile picture. So this is something which is very important. You've to choose the right professional photo. I usually upload DSLR photos on Facebook. You can also set selfie on your profile picture. Otherwise, shoot some photos with DSLR camera by a professional photographer. This will cost you few dollars only and you can easily pay it with your monthly pocket-money. Some people also upload their favorite celebrity, car, bike or other useless things on Facebook. This leaves very bad impression. 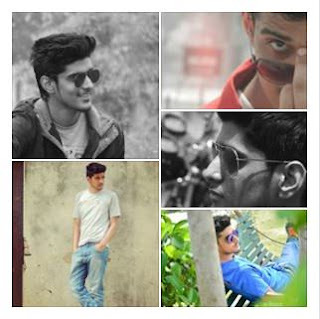 As this is your personal profile, you should use your real picture only, in which you look awesome and it's clear. Also, don't use group photo where you're not identifiable. Now come to the editing part. Well if you've a DSLR picture, you actually don't need to edit it. Keep one thing in your mind that awesomeness is in simplicity. On the other hand, if you're going to upload a selfie or normal camera picture, you can apply Instagram filters in it. I have seen many people who edit too much. Don't do this and keep it natural. You can also write quotes inside picture or in caption with credit. Facebook provide about and intro section using which you can add all your personal details like the work place where you're working or worked earlier and the school you've attended. Unlike in case of Twitter, Facebook about section is more advanced and customized. To edit it, first go to your profile and click "About" link. From the following page, you can edit everything about you like your work, education, professional skills, places, contact info (such as mobile number, email and websites), basic info (such as DOB, gender, language, religious and political view), other names, relationship status, family members, bio and favorite quotes. Make sure that each single detail is filled and accurate. You can also link to your website and other social accounts from the same page. Here two things are very important, which are bio and favorite quotes. 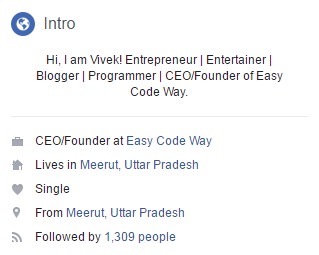 Your bio should be short, simply and unique, that represents you and your work. Just read my bio from below screenshot and you'll get a rough idea on how it should be. Another important thing is favorite quotes. Here you can add any type of quotes like motivational, inspirational, funny, love or something different. Just find them from Google and add 4-5 quotes in your favorite quotes list. Also, make sure to give credits, if possible. These little things leave good impression when someone visits your profile and thus make it more professional. Facebook has introduced a new feature named as "Featured photos" which let you select up to 5 pictures that you want to show on your timeline. These photos will appear below the intro section and it's a great way to give a professional touch to your profile. Here's is the preview of my featured photos. By default, if someone will tag you or directly post on your timeline, it will visible to everyone. Although it's a great feature but some people might have tagged you in each single post which is weird. If you want to look more professional, you've to remove all such posts from your timeline. You might have posted hundreds of status, photos and videos on Facebook. But did you actually think that all of your posts are good? Maybe not. Now it's time to re-check your old posts again and delete all useless things to clean up your timeline. I am not saying to delete your old photos and videos. Those are your sweet memories now. But you can delete other things like unknown picture (such as wallpaper) or useless links that you've shared earlier. 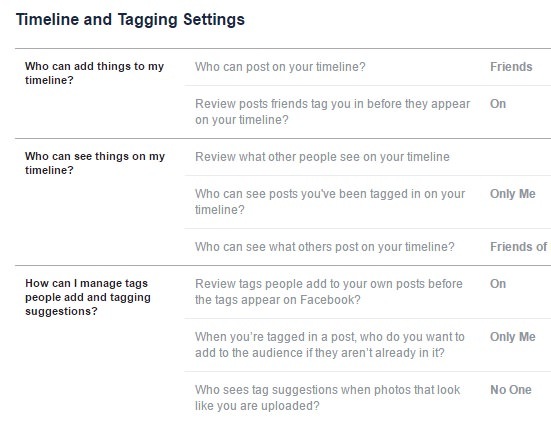 Apart from this, you can remove all your friends posts and tags manually. Facebook provide two options to connect with someone. Either they can add you as a friend or they can follow you. Both these things are different. If you'll add someone as a friend, you both will be added in each other's friend list. This feature is to connect with close people who you know in your real life. On the other hand, follow is one-sided, means if you'll follow someone, only you can get its update in your news feed. I think you already know about the basic difference between them. By default, follow option was disabled for all profiles. You can turn it on so that anonymously people can follow you to get your updates. To add follow button on your profile, first go to your account settings and click "Followers". Under "Who can follow you" section, select "Public" option and that's it. You can also select who can comment on your public posts. Another good thing is that, after enabling this feature, if someone will send you a friend request, he/she will automatically start following you. The more followers you've, the more professional you look. If you'll look at the Facebook pages of celebrity, you'll find that they post regularly to be in touch with their followers. You should also do the same thing. People are waiting to listen from you. There are number of things you can post on your Facebook profile. For example, you can post your own pictures, motivation content, tell what's going on, trending topics and much more. Make sure that you're posting regularly and connecting with your followers. Also, reply back to each single comment. As like in case of other social media sites, Facebook also allow users to create custom username. By default, Facebook will automatically assign you a randomly generated username having awkward numbers in it. However, you can change it anytime with your own choice custom username. To do so, again go to you account settings (in desktop version) and click edit link next to the "Username" option. Now type the username and password and click "Save changes" button. This username will also appear in your profile link as shown in above picture. With custom username, your profile will look more professional and you can easily share the link with anyone. Note that, you can change it one time only, so be careful. You can also read my previous article on how to choose the right username. Many people use to share other's post on their timeline. If you're one of them, please stop doing this. Keep your personal feelings away from your Facebook profile as much as you can. Sharing each single thing you like isn't good. You should share important posts only which can be helpful to your friends or followers and that too, occasionally. Instead of this, create your own original content. 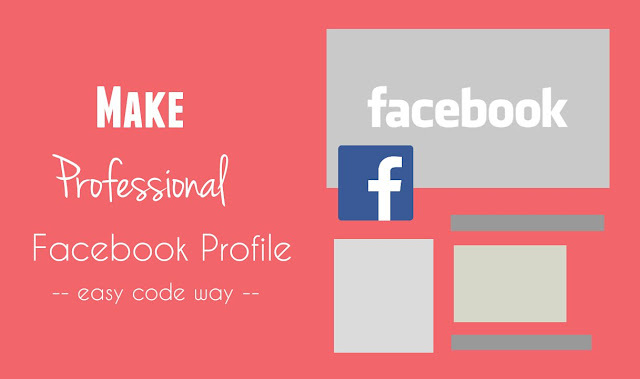 By following these simple tips, you can easily give a professional touch to your Facebook profile. If you've any questions, feel free to ask me in below comment box. Is there something I had missed? Stay tuned for more interesting tutorial.